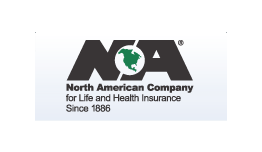 North American Company for Life and Health Insurance (NACOLAH) has been in existence since 1886. Originally founded in the city of Chicago as a mutual assessment company, it considers itself a product-driven company that provides superior value to the customer. It, along with its sister group, North American Company for Life and Health Insurance of New York, offers insurance in all 50 states and the District of Columbia. They are subsidiaries of the Sammons Financial Group. NACOLAH has over $116 billion of life insurance policies in force and total assets of $4.6 billion. NACOLAH has a wide variety of innovative options for term life insurance, as well as a variety of universal life insurance and annuity plans to meet the individual needs of their clients. They feel they offer exceptionally competitive rates and feel that they present a superior product. Need adequate coverage but are on a limited budget. Cover mortgages, credit card debt, car and boat loans, college tuition or other college expenses, and end of life expenses, including high medical expenses. Provide for spouse and dependent coverage. Can be renewed at the end of the term. Are guaranteed renewable to age 95. There are policies for businesses that need to insure key employees or cover temporary business loans or other financial obligations. Term life insurance plans for 10, 15, 20, or 30 years are available.